Tea Partiers have the same attitude towards the Constitution that Christian fundamentalists have towards the Bible: They speak of it with awe and reverence, but they interpret it according to their own inner sense of what it must be saying. In practice, they end up projecting their own desires onto the document. Liberals usually answer populist nonsense with academic research, which is a bad political strategy. Again and again — global warming denial and “creation science” pop to mind — ridiculous ideas circulate (in the part of the population that doesn’t read Scientific American) without an effective answer from the experts in the field. We lack direct, everyday-language books and articles that take on know-nothing myths. Epps’ book fills that hole for the Constitution. He provides easy-to-understand-and-remember labels for the kinds of fallacies conservatives use when they “prove” their points about the Constitution, and then shows how ten conservative articles-of-faith about what the Constitution says are just flat wrong. Myth 1, “the Right is originalist”, prepares the way for the rest. The myth is that only right-wingers care about the literal text of the Constitution or what the Founders meant when they wrote it, while liberals are just making law up as we go along. The problem is that right-wingers also believe they are the only ones who know what the Founders meant, and the result is that crazy right-wing theories about history become crazy right-wing theories about law. From there, Epps takes on myths about states’ rights, international law, the Commerce clause, separation of church and state, and many others you will quickly recognize. My absolute favorite line comes out of his chapter on Myth 6: “The Second Amendment Allows Citizens to Threaten the Government”. If good government actually came from a violent, armed population, then Somalia would be the best-governed place on earth. If conservatives are going to make saints out of America’s founders, liberals need to learn about our own colonial heroes. Roger Williams, who founded Rhode Island after escaping with his life from the Massachusetts Bay Colony theocracy, is a good candidate. When they have opened a gap in the hedge or wall of Separation between the Garden of the Church and the Wildernes of the world, God hathe ever broke down the wall it selfe, removed the Candlestick, &c. and made his Garden a Wildernesse, as at this day. Eboo Patel is the founder of the Interfaith Youth Core and the author of Acts of Faith, a highly acclaimed memoir about finding his identity as both a Muslim and an American. Patel is one of those people who got his name into the Big Rolodex at an early age. He could easily spend the next 30 years playing riffs on the same themes: interfaith cooperation, young people will grow past the prejudices of their elders, Muslims can be pluralists, and so on. I’m not going to name names, but it’s not hard to look around and see Big-Rolodex people who do just that. They have nice, pleasant careers giving talks at conferences, writing an occasional book saying the same things as their other books, and being a TV talking-head whenever their issues come up in the news. Patel dodges that question on the air — that’s his description — but later it gets under his skin: The promise of his Interfaith Youth Core was that young people of every faith would get experience working side-by-side with young people of every other faith on issues of common concern, and so develop mutual respect that would make religious bigotry a thing of the past in a single generation. It’s not happening, is it? So Patel has a business-consultant/friend look into why it isn’t happening, and the friend comes back with a blunt and unwelcome answer: The problem is you. You like running all over the world giving inspirational talks and presenting your Big Idea as the universal answer to every problem, but you haven’t bothered to figure out what those inspired people in your audience are supposed to do. Your organization reflects that; it does everything and nothing. From there, Patel studies how a Big Idea becomes real change, and where IFYC needs to focus. And then the Ground Zero Mosque becomes a teaching moment for him: What kind of people did the community need and not have, who could have kept this issue from getting so out of hand? How could IFYC help make sure that such people will be there next time? It doesn’t come to a sound-bite conclusion. Sacred Ground isn’t a finished book, but that’s because Patel himself is a work in progress. That’s what makes him fascinating. Bet the Farm is a vicarious journey: What if you started with a question that puzzled you, and had the kind of access that let you go wherever you needed to go and talk to whoever you needed to talk to? 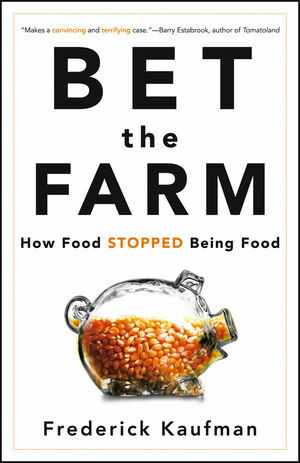 Kaufman is a journalist who has been writing about the food system for decades. He starts with the question: “Why doesn’t everybody get the food they need?” and follows the answer wherever it goes. It takes him to the giant food marketers like Domino’s Pizza; to the giant enterprises that produce the components of pizza: tomato sauce, mozzarella, and pepperoni; to the data-crunchers who are trying to produce a measurable “sustainability index” for food production; to the engineers who are trying to produce better seeds for better crops; to the international technocrats putting together development strategies for the U. N.; to the grain futures market and the monied interests who profit from it. Best observation: The market for food is the exact opposite of a “free” market, because every person in the world has to participate in it on penalty of death. The overall message of the book is that hunger is a question not of food production or even economics, but of power. Power comes from profit, and profit comes from keeping prices low for the farmer and high for the eater. So that’s what our current food system is set up to do. Don’t be surprised when it succeeds.